A couple years ago I remember people thinking (including me) that Google Earth might be that visualization tool that changes how people look at the physical environment. Google Earth does a great job with the effects of humans on the environment, but it just has never been extended to look at anything that can’t be draped over the surface of the Earth. Microsoft came out with a project called WorldWide Telescope a couple years back and if you are like me, you remember looking at it saying that its really cool, but then forgot it existed. Well it looks like not only is WorldWide Telescope still around, but it is being used by the scientific community to help better understand the physical environment around us. 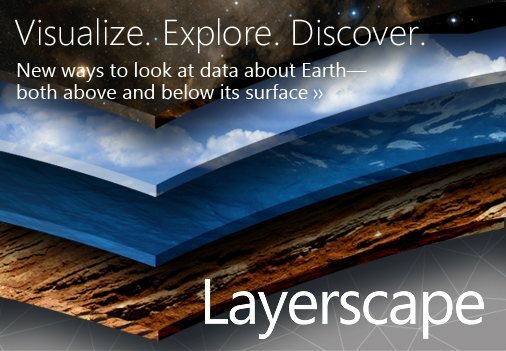 Layerscape is a new tool out of the Microsoft Research team that tries to address the needs of researchers looking at the how the earth works. Based on the popular WorldWide Telescope, also developed by Microsoft Research, Layerscape is a cloud-based instrument that enables earth scientists to analyze and visualize massive amounts of data. With Layerscape, scientists can create three-dimensional virtual tours of the Earth; explore new ways of looking at Earth and oceanic data; and build predictive models in areas such as climate change, health epidemics, and oceanic shifts. The blog post goes into great detail about why Layerscape is needed and how specifically Lee Allison is leveraging these new tools to help Arizona manage their underground resources better. It leverages the visualization datasets of Bing maps, uses Microsoft Excel add-in for analysis and an online community to share your work. You probably are familiar with the earthquake jokes where those of us in Arizona will have beach front property in a couple years, but Allison shows that Arizona, like most of the USA, is an active fault area. Clearly this shows how WorldWide Telescope can be extended to help researchers visualize data quickly and easily and share it with the world. I really need to pay more attention to the Microsoft Research team.